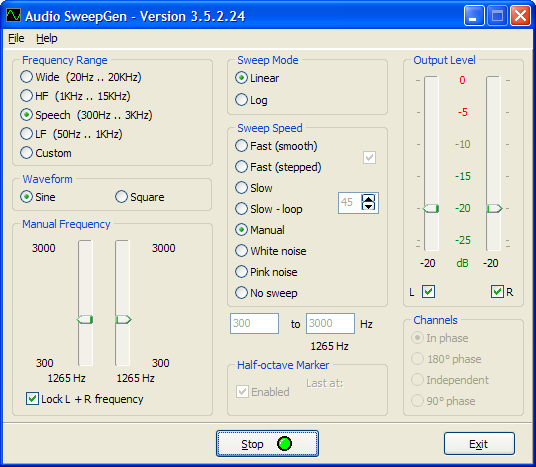 There are four audio tools that I currently offer - a Sweep Generator for frequency response analysis, resonance detection etc., a weather satellite recording level meter SatLevel, a simple Tone Burst Generator and a Vector Scope for direction finding or audio phasing checks. The Audio Tools are currently freeware, but if you require support on the software you must register with me. Please note that you must e-mail me directly for support. You can register for support for SatLevel, SweepGen and VectorScope together for less than about $35. If you like the software, or use it regularly, registering is also an easy way to say "Thank You". Click to register the Audio Tools now! A reminder that you can be on a mailing list free of charge to be automatically notified of any updates. 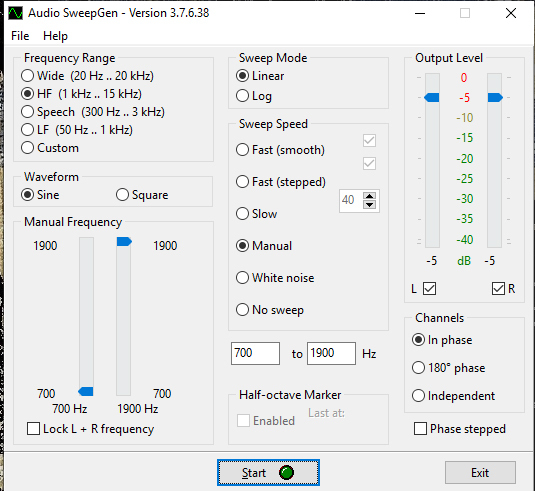 There is a much more advanced version of these tools available as my Audio Test Set which includes the sweep generator with tracking spectrum analyser and oscilloscope functions. Please visit the Audio Test Set page for more details. Dave White (W3VAD) has been using the (unregistered) program to generate a two-tone signal to test his SSB equipment with the settings below. V3.6.2 Add impulse generation option for speaker phasing testing. V3.7.2 Add trigger burst before audio sweep (fast sweep only, 2.0 KHz burst on the right-hand channel). V3.7.4 Correct trigger-burst pop-up hint. If you like the software, or use it regularly, here is an easy way to say "Thank You". This program allows you set the gain or input level to a sound card to record weather satellite signals from Meteor/Resurs, NOAA or SICH/Okean satellites. V1.1.0 uses the newer Delphi 5 runtime library. Program to generate a single sine-wave toneburst when a button is pressed. Full source code is provided, as I see this program more as an example. The Beeper.pas unit that is included can be used in you own code (please acknowledge copyright if you publish this code, and do so unmodified!). Users of this component include BBC News who use it as an alert for blind users. V1.4.0 adds Risetime/Falltime, and Amplitude properties. If you like the software, or use it regularly, registering is an easy way to say "Thank You".